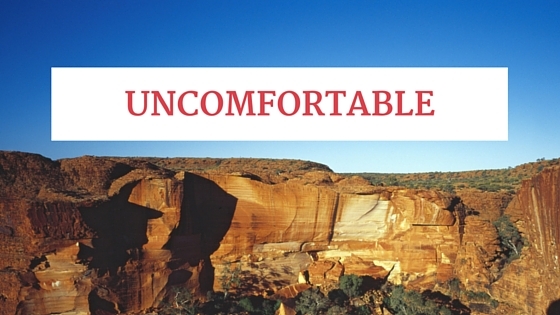 Show of hands: Who likes to be uncomfortable? Who likes to purposely put themselves into awkward situations? Anyone.......? Anyone........? It's not a good feeling is it? The crazy thing is...the uncomfortable place, is where we grow! Is there something that you have always wanted to try, but didn't think you could do it? What is the feeling you get when you think about what it would take to follow your dreams? This is where you need to be to make a change. Change is good, being a better you is the ultimate #selfgoal but it takes a bit of bravery. Sometimes the biggest obstacle in your way is yourself, not wanting to put yourself out there, not feeling that you are good enough or capable. These are the kind of thoughts that hurt us (see the post about changing your mind to change your life). So what are you afraid of? Not knowing how? Learn. Read. Try. Fear of failure? What should be more scary, is the fear of never knowing what you can achieve. Change your mind about the meaning of failure. If you 'fail', use what you learned from the experience to try a different approach. Learning and growing will always be a success. What's stopping you? Let's do this and step out of the comfort, and into the awesome! Your life is going to change. Are you ready?